Families looking for a go-anywhere large SUV near Dallas TX may be intrigued by a used Chevy Suburban in Carrollton TX. This model can handle up to nine passengers with generous legroom and cargo room besides, which means more comfort on a long vacation or when transporting children and friends for extracurricular events and tournaments. Just a shade larger than the Chevy Tahoe SUV, this model not only offers impressive interior space: it also features a brawny 5.3-liter V8 engine that can crank out plenty of power. It can comfortably tow a hefty trailer or boat, and meet other towing demands. The Chevy Suburban models currently available in our inventory are also of recent model years which include some of the latest technology, like an eight-inch touchscreen display for the infotainment system and safety features like a rearview camera and blind spot monitoring. Our inventory is constantly changing, bringing in high-quality models that are perfect for customers searching for the best family hauler. Our vehicles are available for significantly less than a new model. Check out our inventory for the latest models, and schedule a test drive to make sure the perfect used Chevy Suburban is available for you when you visit. Families seeking the latest in comfort and convenience features are able to find them on the Chevy Suburban. 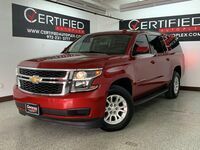 Current used Chevy Suburban models in our inventory are from the 2015 and 2016 model years, and may be available with features like leather upholstery and an overhead DVD entertainment system. Check our inventory for exactly what features are available. Once you have found a model that meets your needs, be sure to schedule a test drive. You can contact a member of our staff here at Certified Autoplex, or fill out the form on this page. There are several used Chevy Suburban models in Carrollton TX that can be ideal for your transportation needs, while also fitting into the budget. Even better, most vehicles sold at our dealership come with a Lifetime Powertrain Warranty that can give you premium peace of mind. Interested in a Used Chevrolet Suburban?